Summer is not a season. It is a state of mind. Thus, someone can experience summer in December, or summer in the snow. I elect to experience summer mostly in July and August and a little bit in June. That's one of the myriad things I've learned from the chick band, the Breeders, in the single "Saints" with the slick lyric "summer is ready when you are." In my estimation, the Breeders are "the best chick band of the Snooze Button Generation and perhaps of all-time." Now, the top selling female performers tend not to be rockers. Of the 15 female groups that have sold at least 10 million albums, none can be considered rock stars. The top three, by the way, are the top Spice Girls, TLC and Destiny's Child. Common answers for finding out "the greatest chick band ever" are the Bangles or the Go-Gos. But those bands simply don't rock hard enough. Other common answers for the best female rocker are Patti Smith or Joan Jett. Not bad. But they might predate the Snooze Button Generation and are solo artists, though Jett's Runaways might be part of the conversation. L7 rocks, too, and I guess so does Hole, even though Courtney Love is so annoying. Some people like Bikini Kill and riot grrrl bands, but I don't know many guys who like those bands. 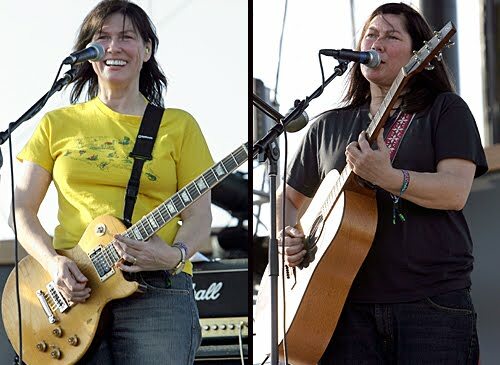 In other words, with twin sisters Kim and Kelley Deal leading the way, the Breeders might very well be the "best chick band ever." Their latest album, "Mountain Battles," is solid, too. Others might argue that, wait a minute, there are male members in the Breeders. Blah, blah, blah. Long live the Breeders! Cannonball!